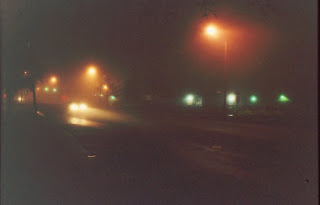 I was working the 4-4 shift one Friday night, Saturday morning, with a thick fog covering the city instead of the usual drizzle, when, just about the time that I was getting ready to call it a night, the dispatcher gave me one last call. You have a different emotion for last calls than you do for all the other calls previous. With the others you are hoping for a long trip, and a big tip, with a last call, you are hoping for a short trip, with no trouble. You just want to do it and go home to bed. At the same time some of my best trips of the night happened at the time that I was supposed to get off. Trips that left me nodding out at the wheel, with the windows rolled down and the heater off in thirty degree weather, with the radio blaring some obnoxious infomercial about vitamins. Tonight it was a SPD call, an acronym for Salem police department. The city issues taxi drivers what is called a police protective license, which means that all drivers were given background checks and do not have criminal records. In some instances we work in conjunction with the police, by picking up the innocent uninjured victims of a crime, accident or impounded vehicle. The dispatcher told me to head to the ambulance entrance to the hospital’s Emergency Room and look for the police car. When I arrived there were two police officers outside of their parked squad car, with a woman, who appeared to be in her early thirties. The older and larger of the two officers was with the woman and the other officer stood about ten feet from them. When I pulled up, the officer with the woman approached my cab, so I rolled down the window. “You’re not a serial killer, are you?” The policeman asked me. “See?” The cop told the woman, “I told you that he would be safe to go with. The woman came over to the cab and got in the front seat beside me. She asked if she could smoke, and I told her that it was a non smoking cab. Then I asked her if she had any money, and she said that she did, but I figured if she was a patient at Bridgeway, they might pay her fare, using their account. I took off as soon as she had her seat belt fastened, and called in my pickup. The woman was crying when she got in, and her emotional outbursts intensified as we drove. “I’m out of cigarettes,” she suddenly said, “I’ll need them to help me calm down, can we stop at a 7/11?” She asked. “Sure,” I said, “there’s one on 17th and Market. I’ll stop there.” I said. “Shout, shout, let it all out….the radio droned as I turned South onto Harold Street off Silverton Road. When I pulled into the parking lot, my passenger sat erect and became quite. Then as soon as I stopped she exploded out of the door and began running towards the rehab center entrance. The door is always locked, so I knew that she couldn’t get in, and the way that she ran reminded me of someone who was trying to get away without paying the fare. She slammed herself against the translucent glass door, and began banging it with here fists, as she shouted let me in! Let me in! After about 30 seconds both door opened and two rehab center personnel poked their heads outside. “Let me in!” She shouted. “We’re full,” the large male nurse with a beard said. I realized at this point that Bridgeway wouldn’t pay for her ride since she might not be admitted. It was already 4:15 AM and I wanted to go home, so I went up to my passenger and told her that the meter read $14.00 and I needed to go. I told her to give me $20.00, which I saw when she paid me for the cigarettes, and I would give her the change. She handed me a Jackson and I gave her six back, and left the scene without finding out if she got in, but then my departure may have helped out her chances.